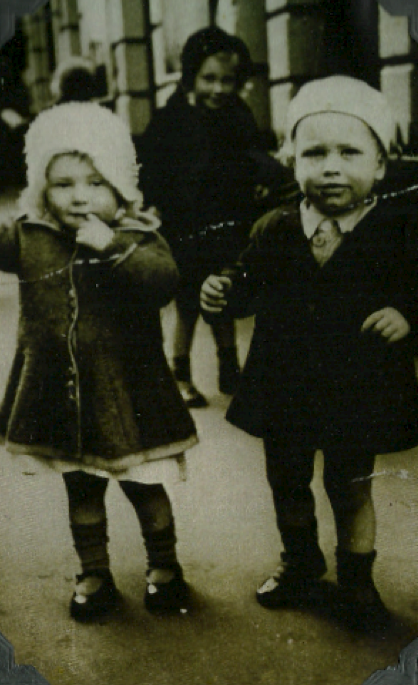 Dad eating chocolate with his twin sister Florence, about seventy years ago. Chocolate consumption was to become a lifelong hobby. My dad's heart operation went okay and he has been transported from Geelong to a hospital in Ballarat. But we now have another problem. Dad managed to get a stroke (just like me), so now we can talk with each other about the experience. I think that, generally, dads get strokes long before their sons, so this is an interesting inversion. He felt very sick in the middle of the week and when I learned the symptoms, I actually knew what was wrong. (I know so few things about the world that I am delighted and staggered when I can offer some advice borne of experience.) Dad's on the same bloodpressure-lowering drug that am. It's called Karvea, and I found that it made me feel sick and incredibly sleepy, because my dosage was too high and my blood pressure had dropped below a hundred, where it had been just over two hundred, prior to treatment. Dad was experiencing exactly the same thing as I did, and I suspected for the same reason. I wonder what the correct protocol is, when you are pretty sure you know what is wrong with a patient but have had no medical training? Should you seek the attention of a nurse and tell them what you think is wrong with the patient and why? From experience, medical staff hate this sort of intervention, as much as a writer would hate someone telling him what's wrong with the words he has written, by someone who hasn't ever written a book in their life. But hang on, that's how my life works. And if the critic is wrong (they usually are) all that happens is I feel miserable for a few hours. I don't actually die. So why be a coward? In the end, my little sister (who's had quite a lot of experience with medical staffwas brave enough to inform the ward sister that she had a fair idea of what was wrong with Dad, since her stupid and neurotic big brother had just suffered a similar experience. Sniffily, they reduced the dosage of Karvea and Dad felt well again. shared stroke will bring us closer together? 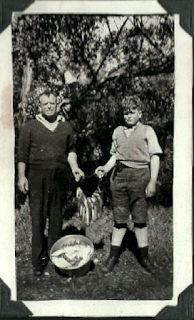 Here is my dad fishing with his dad, a long time ago. Both are probably thinking they will never get cancer or strokes. Both, I regret, are wrong.